Buy Yelp reviews? Don’t. Here’s a better way. Yelp reviews can make or break your business. A recent survey by BrightLocal found that 91% of consumers trust online reviews as much as peer recommendations. Not to mention, Yelp’s 7.9 million monthly visitors. Unfortunately, because customer feedback has the potential to skyrocket a small business’s leads and revenue, fake reviews have started creeping their way into the internet. In the same study, 89% of local consumers believed that they’ve read a false review within the last year–and of that 89%, 33% believed that they read a lot of fakes. And they’re right: in 2013, New York regulators caught nineteen companies posting bogus feedback. They were fined more than $350,000. Despite these major consequences, small business owners with struggling reputations are still tempted by the boost in ratings. If you’re not getting reviews online, you essentially don’t exist to potential customers. Yelp prides itself on being more selective than any other review site. They have built their software to determine which reviews will be “recommended” (the rule followers) or “not recommended” (the rule breakers)–in other words, they’re not going to let you cheat the system. According to their explanation, Yelp’s software tracks signals indicating quality, reliability and user activity. It takes into account the amount of reviews a person has written in the past and if the person will give drastic rating differences between businesses—such as a five star review for a hotel and then a one star review for its local competitor. Yelp can even detect certain wording that might seem suspicious and be a fake review. Currently, Yelp only recommends about 75% of the reviews they receive. You can still see reviews that are “not recommended” through a link on the bottom of their page, but these reviews don’t affect overall star rating. 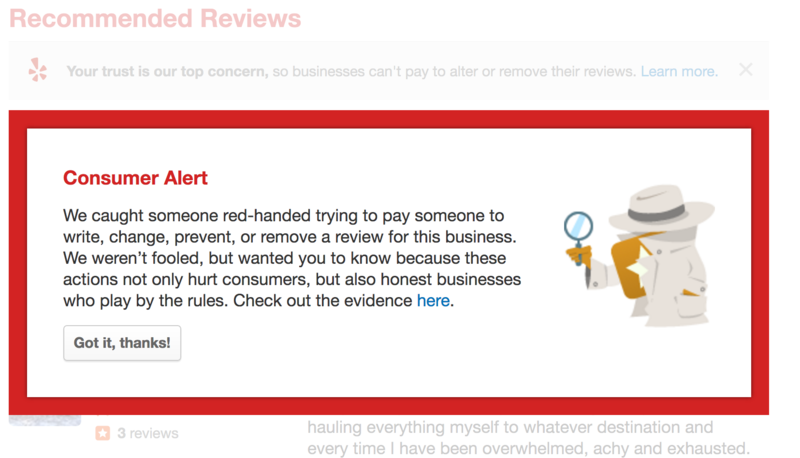 This red pop-up message will block the business’ review page with a warning and explanation. Then, users must manually close the pop-up to read any of the reviews for that business. Obviously, this is far worse than having a few bad reviews: instead of a company with an imperfect review profile capable of honest mistakes (or just one that has some really difficult customers), consumers will view you as an untrustworthy business before they even read the reviews. Google punishes businesses that pay for fake reviews too. They don’t put an alert on the business page like Yelp, but they will delete the review (and there are rumors, if not direct evidence, that Google will shut down accounts for fake reviews as well). In addition, there are many cases in which fake reviews actually cost businesses more than they gained from having a “positive” review. Between 2015 and 2016 Amazon sued more than 1,000 people who were paid to write fake reviews, even if it was for as little as $5. One suit demanded more than $25,000, which included the profits the person made on Amazon, damages, and attorney fees. Any review that is “false or unsubstantiated,” “deceptive,” or contains “undisclosed connections” is illegal under these provisions. This isn’t just an issue of ethics (though it is that, too). Though this should go without saying, if your goal is to succeed in business, you need to follow the law. Even with these mitigating steps, fake reviews still make their way onto the internet all the time. In 2012, data-mining expert, Bing Liu from the University of Chicago-Illinois, approximated that of all customer reviews online, one-third are fake. And a report from Harvard Business School reveals that the amount of fake reviews on Yelp increased by 15 percent from 2006 to 2013. But here’s the thing: even if sites like Yelp and Google don’t automatically catch fake reviews, a customer might. And if a customer realizes that your reviews are fake, you have zero chance of gaining that customer. That customer can then spread the word to other potential customers as well. People can often tell simply by gut instinct if something doesn’t seem real. Maybe the Yelp review greatly contrasts with other reviews for the company or maybe on the reviewer’s profile he or she gives lots of positive reviews for small companies. Also, if the review is in English, the language might be just a bit off—a sign that the company is outsourcing cheaper offshore labor to write the fake reviews. A recent study sought to create a model for identifying fake reviews. In the study, researchers looked at the correlation between the amount of accounts that reviewers have and the amount of fake reviews. They found that if users have 10 or more registered accounts then they are more likely to be posting fake reviews than those who have fewer accounts. If a customer is able to tell if a user has lots of accounts, then it’s a giveaway that the reviews are likely fake. Besides all the other reasonings for why you shouldn’t buy fake reviews, essentially you shouldn’t do it because you want to do what is right. You will feel better about yourself and your business if you earn reviews organically. When those positive reviews come, they will be more rewarding because your business rightfully earned them. Since people can be motivated to write fake reviews, then how can your business motivate consumers to write real reviews? 1. Have Excellent Customer Service! The people who write reviews are typically very passionate—they either had a really bad experience and want to share their opinions or they had an excellent experience and want to encourage others to use your business’s services. One of the best ways to make a customer so passionate that they write positive reviews is to give them an extraordinary customer service experience. Imagine two scenarios: in the first, a customer goes into a fast food restaurant, has an interaction with the cashier, orders and pays for hamburger, gets the hamburger, and then leaves. The customer didn’t have a bad experience, but it wasn’t outstanding. It’s highly unlikely this customer’s going to jump online and leave a review. Here’s the second scenario: the customer walks into the restaurant, is greeted, has a meaningful (yet sweet and short) conversation with the cashier, orders her food, which comes out quickly and includes a special coupon, and is thanked with a smile. How much more likely is it that this customer goes home to write a positive review? Though customer service is a fairly simple concept, it can go a long way in enabling customers to write positive reviews and encourage others to use your business’s services. Up your customer service game by implementing specific training programs for improved customer service. Or consider rewarding employees who go above and beyond. Create a review station in store on a tablet near your cash register. Don’t pressure customers to leave reviews, but always leave the opportunity there. Let customers know you’re on Yelp, then do your part to make your business profile fantastic. You can’t control what people say, but you can verify that you have a correct location, business name and high-quality pictures. While asking for reviews in-person can be very effective, generating reviews is more scalable and more process-oriented. Many companies are finding success by sending out emails to the customers on their email list, thanking them for being a loyal customer and asking them to write a review. Texting is even better: 98% of people open text messages whereas only 20% open emails. So asking for people to leave a review via text can be a very effective option. Reputation management software helps to automate this process. 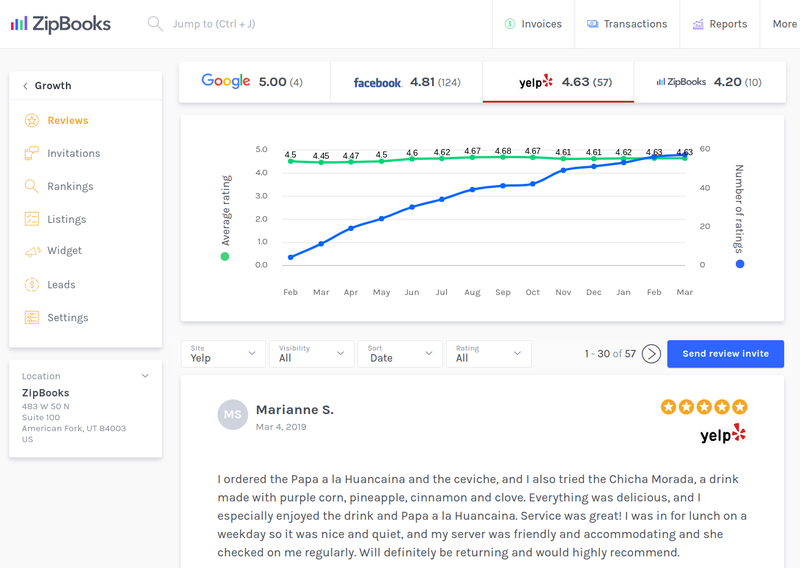 For example, ZipBookers on our Growth plan can automatically follow-up successful transactions with a review invitation (to Google or Facebook). We do not invite customer reviews from Yelp, per Yelp’s guidelines, but we help you track the upward movement of you star-rating as monitor real-time quotes from customers. Using software that puts your growth on auto-pilot will save your business a lot of time and it will bring in the reviews more quickly. How should you handle negative reviews? Even if you establish ways to get real reviews, the reviews might not always be positive. It happens. There will always be customers who occasionally aren’t satisfied and will leave a negative review. Though negative reviews might scare you, they can actually be good for business. Real negative reviews will show that your business is authentic and that a variety of types of people are using your services. Even if you have some negative reviews, the likelihood is that the majority of the reviews will still be positive. Researchers from MIT and NYU performed a study in 2013 that revealed that people leave and are more influenced by positive reviews than negative reviews. So it’s okay. Negative reviews will be there, but as long as they don’t overpower the positive ones they shouldn’t have a major impact. When your business does receive negative reviews, you can still do something about them. You can respond to the people who left the reviews, apologize for their situations, and strive to do what you can to resolve the problems. If you show sincere effort to resolve an unhappy customer’s issue, you won’t just show that customer you care—you’ll also show other potential customers online! Often, unhappy customers are the most passionate—if you’re able to effectively resolve their problems, there’s no small chance they’ll decide to turn around and write a positive review instead! Along with responding to negative reviews, responding to positive reviews shows good customer service. You are showing customers that you are grateful for their feedback and that all reviews are valuable. Share your success! As customers leave reviews on Yelp, share them on social media and on your website. That way people online will immediately see the good things that people have to say about your business when they look for it on the internet. This will increase awareness of your Yelp profile and star rating, inspiring other customers to leave reviews as well. When your business is starting up or it is struggling to get reviews, don’t fret. Resist the temptation to buy fakes and remember that Yelp monitors reviews. It could end up costing you more than what you paid if you get caught, it could be illegal, and you want customers to trust you. Instead, try different tactics to get the real reviews rolling in, such as stepping up your business’s customer service, and establishing online-review methods. Even if you occasionally get negative reviews, tastefully respond to them, do your best to help the customer, and highlight the positive. If you don’t buy Yelp reviews and you do your best to organically get real reviews, your business will soon be getting the five stars that it deserves!